CAR GLO AUTO SPRAY WAX: For manual or automatic systems. Car Glo is applied to a clean, wet, soapy vehicle to improve gloss and drying time. Use 10 to 30ml. per vehicle. SPOX: A ready to use, non-acid wheel cleaner. KRYSTAL KLEAR: A silicon treatment for tires to increase gloss. 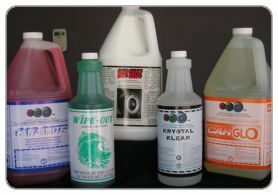 Solvent base and not recommended to be used on the interiors of vehicles. This is a silicone based product and should not be used in areas where boats or cars are being painted as silicone will affect the levelling action of paint.